A worthy successor to Rollercoaster Tycoon, but it never quite emerges from its shadow. Parkitect offers a well constructed attraction, even if the ride is overly familiar. What is it? By-the-numbers Theme Park Simulator with robust systems and plentiful content. Parkitect is pleasant to the point where it’s almost a problem. This is a charming and intelligent theme park simulator which, unlike other recent entries in the genre, places as much emphasis on park management as it does creativity. Its gentle pace and inoffensive art style makes it easy to get sucked into, but its desire to please also makes Parkitect rather risk-averse, and in a year that has witnessed some bold and innovative management sims, Parkitect plays it too safe to truly stand out. The structure is the same as every other game of its ilk. You are the all-seeing, all-knowing god of fun, and you bestow your benevolence by constructing the best theme park you can imagine. You build magnificent rides to attract hundreds of worshippers, and in exchange they sacrifice their wallets to your pricey food stands and tacky souvenir stalls. Whereas Planet Coaster focused on its creative toolset, Parkitect negotiates a pleasing balance between building and maintaining your theme park. Beyond the constraints of budget and available rides, you’re free to construct your park however you like. You can keep things simple by using standard rides and user-created coasters, or you can get hands-on with every little detail, sculpting terrain, tweaking the turns and loops of every coaster, and constructing your own facades and decorations out of geometric shapes. Creatively, Parkitect is sufficiently robust, although it is less powerful than the toolset of Planet Coaster. Paths can only be built in straight lines, for example, while terrain cannot be manipulated with the same level of fidelity as Frontier’s effort. Where Parkitect has the edge on its rivals, however, is in how it challenges you to think harder about the layout and upkeep of your park. In Parkitect, you cannot simply open a burger stall, jack up the price, and let the money roll in. All retail outlets in your park must be stocked with crates from your warehouse. You can simply hire haulers to move stock around the park, but this is a slow and tedious process. Moreover, Parkitect boasts a similar system to Megaquarium whereby your visitors don’t enjoy seeing how the sausage is made. Your park’s overall rating partly comes down to its “immersion” factor, which is damaged when John and Jane Middleclass see some poorly paid labourer stuffing boxes of frankfurters into the back of your $7 hot dog stand. You can avoid visitors witnessing the horror of capitalist exploitation by careful placement of special “Employee” paths, which can be concealed with decorations like hedges and fences. Alternatively, you can build a network of supply depots connected by underground tubes to ferry stock around the park, then use haulers to transport the stock from depot to the stalls. This is much more efficient, but also much more expensive. In this manner, you actually need to think about where you place buildings in your park. It’s useful to have an even dispersal of stalls, but to make this efficient means building a lot of pricey depots. These hints of strategy are complemented by a robust simulation where everything that happens in the game has a tangible impact on the status of your park. Much of this is represented visually. If your park is accosted by vandals, you can see them running around kicking over bins and benches, and this will impact your park’s “dirtiness” rating. Meanwhile, if a storm passes over your park, rides will be shut down and your profits will start to tumble. Speaking of profits, although getting your Park financially stable is not difficult, you can’t ignore the finances and hope for the best. You need to consult the spreadsheets, identify where the shortfall is, and adjust prices accordingly. Parkitect isn’t short of stuff to do. Alongside the sandbox mode, the campaign includes 26 different parks to build, each of which has its own unique set of challenges. An early example sees you repurposing a disused airfield, forcing you to build your park on a long but narrow strip of land. There are also dozens of different rides to unlock, and the coaster selection is particularly impressive, ranging from simple junior coasters to log-flumes, flying coasters, and even a bobsled run. You can’t fault Parkitect for its generosity, nor for its cleanly designed simulation. Nonetheless, Parkitect does exhibit a few issues. Most prominent it the UI, which aside from being greyer than Britain in December, is also oddly designed. For starters, there’s no Undo button, so any mistakenly placed objects have to be manually demolished. Worse, demolition is a two-step process, with you first having to highlight the object for demolition, and then click a tiny tick in the bottom of the screen. Another annoying issue is that menus for rides always appear in the centre of the screen rather than off to one side, which means you’re obscured from viewing the ride that you want to edit. Probably the weakest part of the UI, however, is the coaster builder itself. To start building a coaster, you place a station like any other object. But actually building the coaster requires you to use the buttons on the coaster menu. If you try to click on the coaster again, the game will immediately try to place a ride entrance. It’s all very counter-intuitive, and after dragging and pulling out rides in Planet Coaster, using Parkitect’s system feels positively Neolithic. More generally, Parkitect’s presentation is a little staid. It’s not ugly by any means, but stylistically it’s also not very distinctive. I’m particularly nonplussed by the bobbleheaded characters, which makes your park look like it’s populated by Funko Pops, and surely nobody wants that. Parkitect does take on more personality at night, when your rides are suddenly illuminated by hundreds of tiny lights, but these moments are only fleeting. There are flickers of personality and invention, but otherwise Parkitect stands on the shoulders of Rollercoaster Tycoon, hurling into the same bin post-ride at a slightly elevated level. It’s the most well-rounded theme park simulator of recent years. But if you look at management sim genre more broadly, there’s stiff competition. From the quirky and characterful Two Point Hospital, to Megaquarium, which has a similar structure (and visual style) to Parkitect, but applies it to a very different setting. Both those games bring something interesting and memorable to the genre. 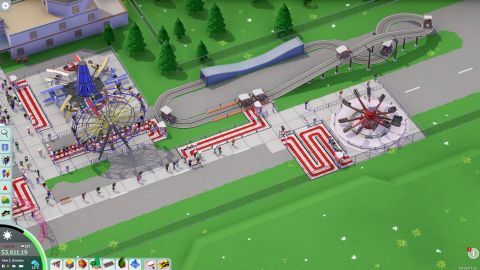 Parkitect, for all its quality, is content to be a fairground attraction: fun and mechanically sound, but not something you’re going to queue up hours for.